The de Havilland DH 98 Mosquito was perhaps the greatest all-round combat aircraft of World War II. The "Mossie" was originally designed as a fast, unarmed, light bomber. When flying tests commenced on 25 November 1940 this "wooden wonder" became the world's fastest operational aircraft with a top speed of almost 400 mph. It also out-manoeuvred most fighters. Altogether 7,781 Mosquitoes were built and 27 different versions were produced as fighter-bombers, photo-reconnaissance, low- and high-level day and night bombers, mine-layers, pathfinders and long-range day and night fighters. 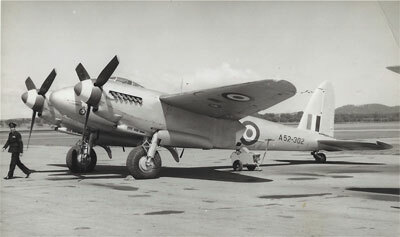 Mosquitoes served in RAAF Nos 456 and 464 Squadrons, which operated RAF-serial numbered fighter and bomber versions. In 1942, the Australian de Havilland factory at Bankstown commenced production of a fighter-bomber Mosquito. The first Australian Mosquito was delivered on 23 July 1943 and accepted by the RAAF on 5 March 1944 with 212 aircraft built at Bankstown (A52-1/212). The RAAF Mosquitoes played a limited, but effective part, in the later years of the Pacific War and service with No 1 Photo Reconnaissance Unit, Nos 87 and 94 Squadrons, No 78 Wing, No 1 Aircraft Performance Unit, Aircraft Research and Development Unit, Central Flying School, No 5 Operational Training Unit and Ferry/Survey Flights. Mosquito flying ceased in 1954, and the aircraft still on RAAF strength were sent for disposal, except for a few which were transferred to the RNZAF.